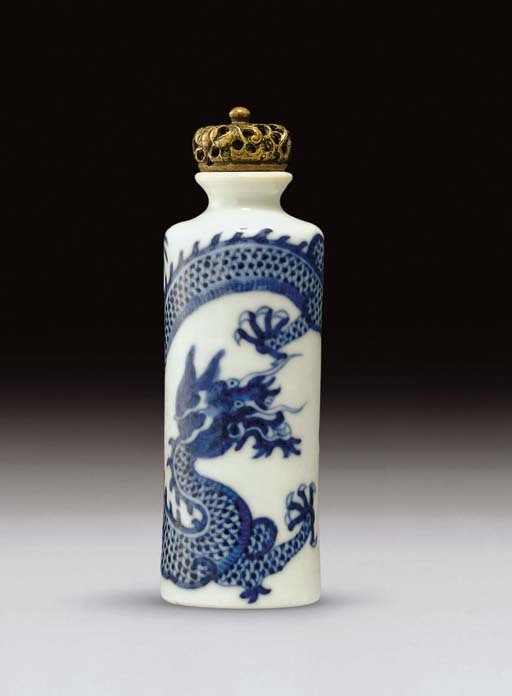 This unusual bottle belongs to a well-known group of early blue-and-white cylindrical bottles which was inspired by columns in the Palace wrapped in dragon-rugs so that the apparently disassociated segments of the dragon's body on the rugs join to make a coherent design when wrapped around the column. These bottles appear to have been first produced in the last decades of the eighteenth century as an Imperial group - confirmed as in this example by the standard use of five-clawed dragons - and probably continued into the early-nineteenth century. A common feature of these "dragon pillar" bottles is the biscuit foot cut with concentric circles found here. This is one of the earliest groups of Imperial blue-and-white porcelain snuff bottles. A bottle with a very similar design is illustrated in The Au Hang Collection of Chinese Snuff Bottles, p. 198, no. 268, and another with a crackled ground is illustrated by L.S. Perry, Chinese Snuff Bottles, The Adventures & Studies of a Collector, p. 79, no. 57.